My awesome cousin Anna heard my pleas for more zucchini recipes and sent along a whole bunch! As I’ve mentioned, I love trying recipes that use more than one of my weekly ingredients, so of course this was the first recipe I tried. 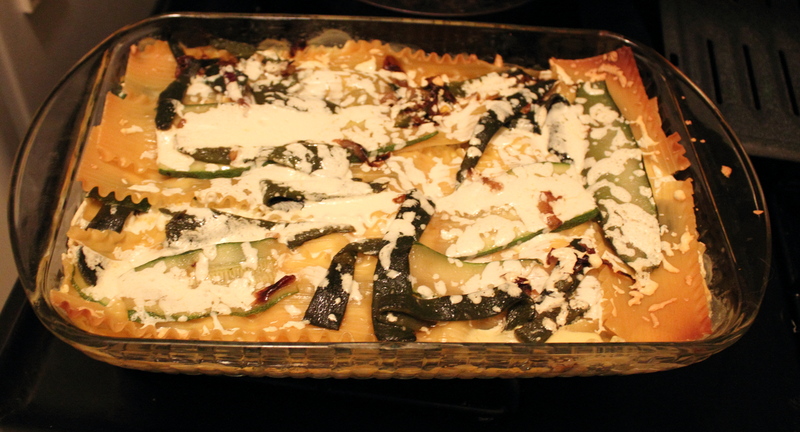 This is a lasagna where the layers are a pureed mix of sautéed corn and cream, no-boil lasagna noodles, and a mix of onions, zucchini and poblano peppers, all topped with Oaxaca cheese. My neighborhood grocery store carries Oaxaca cheese, but if you can’t find it, the recipe suggest substituting mozzarella. The original recipe says to use an 11×8 baking dish. Naturally, I only had a 11×7 or a 9×13. I sized up, but in hindsight, I should have sized down. The bigger dish meant that the veggies didn’t fully cover the noodles, so they didn’t get soft on the top layer. You can see from this photo that I didn’t have enough veggies to cover the top, so the noodles got a little crispy. Nothing some time in the fridge as leftovers won’t fix! However, this meant that I avoided broiling the lasagna to crisp the cheese, since I didn’t want to burn the exposed noodles. 1. Put poblano chiles under the broiler, turning every 3 minutes until skin is blistered. Place in plastic bag to sweat for about 15 minutes, then peel skin off under cold running water. Remove stem, seeds, and membrane and cut into 1 inch strips. 2. Melt 2 tablespoons butter in a heavy saucepan over medium heat. Add 2 minced garlic cloves and saute for 1 minute. Mix in the corn and saute for 5 more minutes. Stir in the cream and thyme. Cook over medium-low heat for 5 additional minutes. Let cool slightly before pureeing in a blender until smooth. 3. Heat the remaining 2 tablespoons butter in a heavy skillet over medium heat. Add the onions and saute until translucent. Add the remaining garlic and cook for 1 minute. Mix in the zucchini and poblano strips and cook for 5 minutes, turning often. 4. Spread about 1/4 of the corn mixture over the bottom of an 11 x 8-inch baking dish. Cover with a layer of lasagna sheets. Spread 1/4 of the poblano mixture and 1/4 of the cheese over the pasta. Repeat the layering 3 more times. 5. Cover the lasagna with foil and bake until the pasta is cooked and tender, about 50 minutes. 6. Remove the foil and broil until golden brown and bubbly, 8 to 10 minutes. Let stand for 15 minutes before serving.